The book conveniently cherry picks a bunch of facts, true though some are, made up as others might be, to present a lopsided and sometimes made up view of history. The book is about Zulfiqar Ali Bhutto and his family, but switches over to dry facts and lots of omissions when convenient - in this case, Zulfi's large role in instigating and supporting the civil war in East Pakistan, and his sheer meglomania throughout in not willing to accept a party which had won more seats and more votes than his own. There is much history written about this era, some good, many bad, and having read much of it the gloss and spin in this spin makes for painful reading. Continue reading "Fatima Bhutto: Songs of Blood and Swords"
There have been a lot of books on the recent economic crisis, but most of them address only small parts of the systematic failures which caused the crisis, and they don't do a good job of explaining what the financial system looks like before moving onto the crisis itself. ECONned is a really good overview of both the systems in place and the crisis. The book isn't about just the crisis, but rather the current financial system and the regulatory, personal and economic interests which shaped it. The author's blog is really interesting as well. Other books, like Micheal Lewis's The Big Short do a good job of telling a small part of the story, but completely fail to deliver on what actually happened. Continue reading "ECONned: How Unenlightened Self Interest Undermined Democracy and Corrupted Capitalism"
The book has more stories about Fenyman, continued on from his earlier book, Surely You're Joking, Mr. Feynman! (Adventures of a Curious Character) . In this he writes about love (the book title come's from a letter from his wife), science, and random bits from his life, like how he became a scientist in the first place. The second half of the book is on Fenyman's work in the commision investigating the space shuttle Challanger disaster - it gives a lot of great insight as to how government and large organizations work. Continue reading "Richard Fenyman: What do you care what other people think?" This book is a must read for countries like Pakistan, which have already gone through multiple rounds of "shock therapy" at the hands of the IMF, and are just about to sign on the dotted line for yet another one. The book doesn't rail against capitalism, rather it rails against the extreme right-wing ideologues who wormed their way into economic seats of power in the US, and into the IMF and the World Bank. The problem with neoconservatives is that they live in a bubble full of right wing fantasies, and never condensed to step out into the real world and see how far their neo-liberal fantasies had diverged from the real world. What looks good on paper often pans out different in the real world, especially in corrupt societies like Pakistan - and this is one factor which the IMF never seems to account for properly. In a poor country like Pakistan, regressive taxes like Central Excise Duty on services and sales tax on everything (even drinking water!) are highly regressive, and with Pakistan's highly corrupt taxation system just give more of an incentive to people to stay further out of the tax net. It's a vicious cycle... but read the book for criticisms of the IMF and their achievements in the developing world. Pakistan is about to make a deal with the IMF..
Continue reading "Naomi Klein - The Shock Doctrine"
Interesting book on how business is done in India and China, though not as good as the reviews on Amazon make it out to be. It seems overly directed towards the western reader who doesn't have much knowledge of the two countries, and hasn't read much else about them. The basic gist of the book is that India and China have two very different approaches to business, and both countries have to be dealt with very differently. There are lots of examples in the book, but there is where Friedman is better, in his book The World is Flat. Both books have their flaws, but the hundered of examples and anecdotes in both of them make them a worthwhile read. Continue reading "Tarun Khanna: Billions of Entrepreneurs"
A first hand account of Pakistan's history - Asghar Khan has lived through it all, and has been involved with all the major political and army leaders throughout Pakistan's history. If not for Bhutto's rigging and Zial Huq's coup, Asghar Khan would now be written in the history books. It's a testament to the threat he posed to the powers that be that despite the impact he had on Pakistani politics, he's been written out of the official histories of Pakistan, both by Zia and than by Bhutto, who both disliked him intensely - Bhutto tried to kill him, while Zia put him in jail for years. Continue reading "M. Asghar Khan: We've learnt nothing from history"
It's a brilliant, encyclopedic summary of the current situation in Pakistan. The book, just like his last book, is extremely timely, as region after region in Pakistan falls to the Taliban, and the government pulls back further and further. Continue reading "Ahmed Rashid: Descent into Chaos"
Michael Pollan visits Google's Mountain View, CA, headquarters to discuss his book, "In Defense of Food." Continue reading "Micheal Pollan: In defense of Food"
Don't read the reviews. Just read the book. It's that good. A damn good book, as well as a good history of Zia. Sure it's fiction, but considering how much of Pakistani history is fictionalized, this is as close as you can get. How did Zia die? Put down all those dusty histories and read this to find out! Highly recommended. Best read after Charlie Wilson's War, which fills on some of the back story on all the American/Afghan intrigues hinted on in the book. It's not often a author gets added to my "Must read all his books" list - looking forward to his next one! A wonderfully insightful book, strolls though history, academia, psychology, cognitive science, probability theory, philosophy, statistics and more. The back of the book claims that the book "will change the way you look at the world", and it does. Taleb argues that events and life itself are far more random than we perceive them to be - the human brain just isn't able to cope up with the complexities of the modern world, most of which have sprung up in the last couple of hundred years, while our brains still haven't evolved much further than the hunter-gatherer stage. This is the most interesting part of the book, where Taleb discusses various studies on how the human brain processes and perceives information, probability and data. We fit explanations to events post-facto - but the world is not so easily squeezable into the theories we built to describe the past and than extrapolate to predict the future. Our brains are wired in a such a way that we construct linear narratives, or theories about events, in an attempt to simplify and understand - but real life is not linear, and these stories about how events happen are too simplified to be of much use when the next Black Swan comes about. Continue reading "Nassim Nicholas Taleb: The Black Swan"
Another great economics book from Tim Harford, exploring the hidden rationalizations we make during everyday life. "In this deftly reasoned book, Harford argues that life is logical after all. Under the surface of everyday insanity, hidden incentives are at work, and Harford shows these incentives emerging in the most unlikely places." A great followup to The Undercover Economist. Thomas Schelling, a Nobel prize winning economist on the book: "This is a terrific read. It's one those books that forever changes the way you look at things. It proves economics is not a subject for dull textbooks; but is really a way of thinking that can shed light on all aspects of life." A lot of newspaper editorials, opinion pieces and even the reporting consists of the proverbial blind man groping a herd of elephants, trying to figure out why things happen the way they do in Pakistan - Tim Harford lucidly explains that often even the most seemingly irrational acts have a logical explanation. Continue reading "Tim Harford: The Logic of Life"
The book traces Pakistan's nuclear history, wherein Pakistan with Chinese, Saudi, American and North Korean help (and a whole lot of private contractors) developed numerous types of nuclear weapons and delivery systems. The book is really interesting, not because of the exact details of how Pakistan developed the bomb, but the insight it gives on how Pakistan really operates. It was Zulfiqar Ali Bhutto who kicked of Pakistan's nuclear programme, famously declaring "we will eat grass if we have to, but we will make the bomb". For the next 20 years this statement was literally and figuratively true - everything took a backseat was tens of billions of dollars were poured into two competing nuclear labs. This is the most depressing account of Pakistani/American political history I've read. The old maxim "the end justifies the means" was the one and only motto of the Pakistan Army & the Republican Party, which ran the country for the next 30 years, sucking in practically every dollar of foreign aid and diverting it to nuclear weapons development and regular arms procurement. They had to let parts of the billions of dollars pouring in for the Afghan war though, under American pressure, but development aid money was mostly fully diverted to the bomb. Continue reading "Deception: Pakistan, the United States, and the Secret Trade in Nuclear Weapons"
This is the book which every Pakistani politician, columnist, drawing room warrior, TV talking head, the proverbial man on the street, newspaper & TV reporter, and just about everyone else breathing on the streets of Pakistan should read, now, before it's too late. The lack of economic knowledge, and the number of economic things people get wrong even, even Harvard and Oxford educated politicians, is amazing. Newspapers, and TV especially perpetuates many economic myths and fallacies, and often make doom-laden statements which make no sense - though with our politicians it can be (and has been) said that they make no sense on anything at all, at least if you're viewing it from a logical point of view. This book cuts through all that nonsense and lay's bare the economic workings of much that we see going on around us. For example, just today there is a report in the paper about how 6 major bridges are about to collapse in Karachi as the City government can't be bothered to fix them - the poor reporter rails and rants trying to figure out why this is the case - he/she will really benefit from reading this book. The chapter on "Why Poor Countries are Poor" is a good explanation of how Pakistan works - though a lot of Pakistani's understand innately as to why we are where we are, Tim Harford logically lays it out, and the heuristics built up over years of dealing with bureaucracy and corruption make even more sense. There are many other 'readable' books on economics being written today, but this book really stands out. Continue reading "The Undercover Economist"
I hate to give the game away right here at the beginning of a whole book devoted to the subject, and I'm tempted to complicate matters in the interest of keeping things going for a couple hundred more pages or so. I'll try to resist, but will go ahead and add a few more details to flesh out the recommendations. Like, eating a little meat isn't going to kill you, though it might be better approached as a side dish than as a main. And you're better off eating whole fresh foods rather than processed food products. That's what I mean by the recommendation to "eat food," which is not quite as simple as it sounds. For while it used to be that food was all you could eat, today there are thousands of other edible foodlikesubstances in the supermarket. These novel products of food science often come in packages elaborately festooned with health claims, which brings me to another, somewhat counterintuitive, piece of advice: If you're concerned about your health, you should probably avoid products that make health claims. Why? Because a health claim on a food product is a strong indication it's not really food, and food is what you want to eat. You can see how quickly things can get complicated. The above is from the introduction of a new book by Micheal Pollan, In Defense of Food. Read the whole introduction to the book here. It's the single best, most concise food advise I've ever read. His last book was, The Omnivores Dilemma was eye opening, and this book is now on my list of must read books. The Google page on the new books has some reviews. Continue reading "Eat food. Not too much. Mostly plants." One of those rare must read books, the sort which you go out and recommend to people. You could look up the comments on Amazon for a whole lot of reviews, opinion and just plain noise, but better yet, just read it! In short - the world is a lot more random than we perceive it to be, for our brains just aren't wired to deal with what the world has become - our genes and brain patterns remain stuck in the past while trying to deal with a world which has advanced faster than we have. Risk, probability, literature, how the brain works, wall street - just a few of the many topics the Taleb touches on. Continue reading "Nassim Nicholas Taleb: Fooled By Randomness"
Too wonderful for words. A kid-eyed travelogue through white middle-class America in the 50's, and what a world that was. The funniest book I've read a in long, long time. A comment on Amazon calls it "This is a ray of sunshine in the literary world" and damn right it is! All of Bill Bryson's books are great, and this one ranks at the top. Few individuals significantly alter the course of history. Fewer still modify the map of the world. Hardly anyone can be credited with creating a nation state. Muhammad Ali Jinnah did all three. Stanley Wolpert on Jinnah in his biography Jinnah of Pakistan. A fascinating read about a fascinating man. There are books, and then there are books, and a big fat thick line which divides the great books from the rest. The divide between just a book and a great book is so vast that they should be called something else altogether. Too many literature published today, to take a popular one at random like the Harry Potter series, is damn good entertainment, but certainly not a great book. Probably the main difference between a regular book and a great one is that the regular one entertains for the duration of the book, while the great one stays with you for life, and has the power to potentially redefine the way you think. There are many lists floating around the interweb, but the problem with them all is that they're not this list. 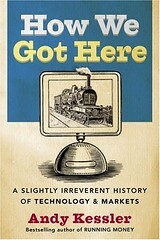 Continue reading "Books everyone should read"
How we got here: A Slightly Irreverent History of Technology and Markets is a superfast history of capital markets and the computer industry. A free pdf copy is available at the publishers website. Most history books push a ton load of facts at you which sometime makes it hard to grasp the bigger picture(s). This book forgoes the details for a whirlwind tour of the industrial revolution, the evolution of capital markets, and puts today's IT revolution in perspective. The book jumps all over the place, but is very interesting nonetheless. Continue reading "A Slightly Irreverent History of Technology and Markets"
I've been waiting for this book for the last five years... the author has written bits and pieces of the contents in various articles over the years, but finally the entire book is done. There was a bit of drama at the book launch, which put it on the front page of Dawn. Now, generally I write about a book after reading it, but this book has been banned in Pakistan! Someone high up to must have read in today's paper about the book launch,and ordered it removed from the shelves today in the morning. Liberty Books, the only major bookstore chain in Pakistan pulled the books from the shelves without selling a copy, while OUP, the publishers in Pakistan sold a few copies in the morning before closing sales. The author's friends and well wishers must have been congratulating her all day long, as the sales of the book around the world are going to shoot up drastically along with the credibility of the book. It was a interesting time for the book to come out, as while on one hand the Chief Justice's illegal dismissal is putting a spotlight on the many constitutional transgressions by the military, while the book exposes the economic plundering of the country by the military. A second front, so to speak, and no army wants to fight on two fronts at the same time. Continue reading "Military Inc.: Inside Pakistan's Military Economy"
You are looking at the 41 entries filed under the Books category.